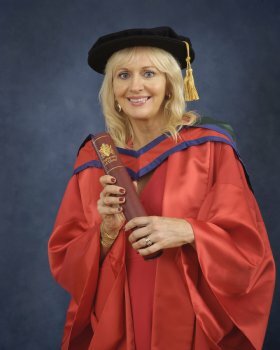 The 'innate integrity' of Miriam O’Callaghan’s journalism was praised by the University of Ulster in Derry today when it awarded the popular RTE broadcaster an honorary Doctor of Letters (DLitt) degree on the final day of the summer graduation ceremonies. Delivering the citation, Professor Deirdre Heenan, Provost of the University’s Magee campus in the city, said: "She is the ultimate multi-tasker. Humanity and compassion are the central elements of her journalism." Hundreds of new graduates, their relatives, friends and academics applauded enthusiastically in the city’s Millennium Forum concert hall when the University’s Vice-Chancellor, Professor Richard Barnett, presented her with her certificate as Doctor of Letters in recognition of her services to broadcasting. Dr O’Callaghan started her television career as a researcher with Thames Television in London in the early 1980s before becoming a familiar face to UK audiences as a reporter on BBC 2’s "Newsnight" and later joining RTE where she is a household name as a current affairs and chat show presenter. She is anchor of RTE Television’s flagship 'Prime Time', hosts 'Saturday Night With Miriam' and RTE Radio’s 'Miriam Meets'. Dr O’Callaghan’s husband, Steve Carson, RTE’s Director of Programmes,TV, and her mother, also called Miriam O’Callaghan, accompanied her at the conferral. Recalling the broadcaster’s early career as a BBC 'Newsnight' reporter, Professor Heenan said she provided in-depth reports about the Northern Ireland peace process and infused them with a knowledge of history that set out essential co context which helped viewers comes to terms with the complexities of the topic. Last year RTE viewers voted Nobel Laureate John Hume, who is an honorary professor of the University of Ulster, as 'Ireland’s Greatest' after Dr O’Callaghan championed him in a film she made for an RTE Television series. Professor Heenan said: "Miriam is known and respected right across the island of Ireland because of her hard-earned experience, sheer professionalism and an innate integrity that underpins her journalism and her skills as a television producer. "She draws an audience from all the age groups. And her colleagues will tell you that much of her success, for example in her crusade for John Hume as the Greatest Irishman, rests on the credibility and the affection that she has among viewers and listeners. In short, they trust her." Responding, Miriam said: "You cannot compare the Northern Ireland of today with the Northern Ireland of the Troubles. "Many many people worked to bring about peace in this part of the world, but without John Hume, peace would never have happened. I'd like to thank John Hume for all he's done for Ireland."